February 16th will be the first day of the New Year on the Chinese lunar calendar. Each year of the calendar’s 12-year cycle is represented by an animal. According to the Chinese zodiac, people born during a given year share traits with that animal. This year, 2018 is the year of the Dog. Those born in the Year of the Dog are said to be very sincere and they’re very loyal to friends. Click the image below to order a copy of the book for this lesson. Clicking my Amazon affiliate link does result in a small commission for me at no extra cost to you. Read Works is also an online reading resource with multiple text selections about the Chinese New Year! You could also choose this time to do a culture study about China. Read Works also offers several FREE text selections to fill that need as well! The function of education is to teach one to think intensively and to think critically. Intelligence plus character – that is the goal of true education. – Martin Luther King Jr.
February is Black History Month. This blog contains links to some of my favorite ideas and books to use when designing lesson plans to celebrate and learn at the same time. First, here is a round up of some great resources from Teachers Pay Teachers. Designed with third and fourth graders in mind, this biographies resource includes materials for students to use while conducting research, as well as materials for the presentation of their final writing piece, in a Biography Lapbook. Click HERE to find this product, Biography Lapbook! Looking for some new and fresh activities for Black History Month? This pack includes writing, reading, vocabulary, crafts, and more! Click HERE to find this product Black History Month Activities! Below are a few FABULOUS books to read to students during Black History Month. Click on any image to order from my Amazon site. The following links are affiliate links to Amazon. If you choose to make a purchase, I do receive a small commission. This post is a “reblog” from several years ago. This is still one of the BEST lessons I ever taught in the classroom! Every teacher has days when they reflect on a lesson and think, “Wow, that did not work out like I expected.” Then there are the days when everything clicks. The students respond in amazing ways and you know that you hit a “sweet” spot. Today was one of those “sweet” spot days! In honor of the upcoming Martin Luther King Holiday, we conducted a close read text about his life and his most famous speech. We started the class by dreaming. Yes, we were dreaming. I asked students to think about what their BIG dream would be for our country or even our world. I was amazed at their answers! 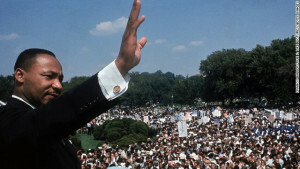 After discussing their dreams, I introduced someone else who had BIG dreams, Dr. Martin Luther King Jr. The students watched this mini-bio about Dr. King. Using multi-sensory instructional techniques is not new. We have done it for years. Think about the song “I’m a Little Teapot.” I can always remember that song because I can still do the motions with it. That is multi-sensory instruction! My son is dyslexic. For the past 2 years, he has received multi-sensory language instruction therapy. When he was in the 7th grade, he only read at a 2.4 grade-level equivalency. He is now a 9th grader. In December of 2017, his grade-level reading equivalency was 8.3!!! This multi-sensory, systematic approach is the ONLY thing that has worked for him. I am incorporating more and more of this instructional approach into my own work with struggling readers. How about multi-sensory in physical education to teach other content areas? Take a look at my colleague’s approach to teaching Skeletal Anatomy to PreK students! Happy Teaching! Go make some Multi-Sensory Magic! It is New Year’s Eve, cuddle up with the 3Rs! Teachers need the 3Rs on New Year’s Eve. I don’t mean reading, writing, etc. I mean REST, REFLECT, and REJUVENATE! Teaching is the most draining, yet most rewarding career in the world. I am struggling with some learning of my own. . . learning to take care of myself. This is hard for most of us because we spend our time taking care of everyone else. I updated this blog quite frequently when I was in the classroom full time. The past year and a half, I have served as the reading specialist at my school. My blogging has suffered because (again) I have been too busy with everything else to take time for myself. If you are the same, I hope you will follow my blog this year. I will share what we are doing in our classrooms at school and what I am learning in the greatest classroom of all. . .LIFE! So cuddle up today with the 3Rs! These items help you look cute when cuddling. . . Click here for a SALE on C.C. Beanies! PS: Yes, it is New Year’s Eve. No, I will not go out and party because every day is a party in this house! Is your student ready for 2nd grade? How can you tell? Simple: Can your student read fluently? Reading fluency is the first step to comprehension. Together fluency and comprehension are the #1 indicators of future academic success. Reading builds knowledge, exposes students to proper grammar and exemplary writing techniques, helps develop writing skills, and develops essential critical thinking skills. In other words, READING IS THE HOLY GRAIL! How can I help my student learn to read fluently? I designed this Smart Start test for parents. Can your student read these sight words automatically? Can your students read 68 words per minute with a 96% accuracy rate? If not, take a look at what you need to do at home. Peanut butter and jelly . . .
Grits and eggs . . .
RC and a moon pie . . .
Certain things in this life are meant to be enjoyed together. Two of those are reading and writing. My past few blog posts have focused on student engagement. Writing is an excellent engagement strategy. Students WILL write when the writing is authentic and purposeful. Writing will strengthen their reading skills. The more reading your students do, the better writers they will become. Reading and writing were meant to be taught together. When America forgot that important fact, I simply do not know. I do know that it is high time we have our students writing again! Allow them to write about what is important to them. Teach them to write about what interests them. Model for them how to SHOW and not just TELL with their words. When we teach them to write by giving them opportunities to write in meaningful ways, they will know how to write when it is time to begin essays, analyzing complex informational text, and citing text evidence. We expect them to pick up a pencil in the third grade and eloquently compare or contrast two complex text passages when they have never even written two complete sentences. We must model writing for them and model it early on! I have always believed this. This week, our staff was treated to a series of writing workshops led by author, Rick Shelton. It was amazing! His workshop has awakened our little school to the many authentic and purposeful writing opportunities we can provide for our students.